US Mobility - Mobility Scooters, Electric Wheelchairs, Electric Scooters, Mobility Scooter Rental, Pride, Jazzy, Invacare, Shoprider, Cheap Power Wheelchair for sale or rent, Low Cost and Affordable. Complete Guide & Directory of Mobility Scooter Suppliers to help keep you moving. US Mobility has been set up to help individuals and families locate electric scooters & electric wheelchairs in their own local areas. Whether you wish to buy a brand new electric scooter or you are looking for a used electric wheelchair, US Mobility makes it easy to find your nearest Mobility supplier. Our guide and directory will also show you where you can rent electric scooters & electric wheelchairs, if you choose not to buy one. necessary by getting your doctor to issue you with a prescription, stating that you need a scooter or wheelchair for mobility. Mobility has become a real issue in society today. Many people suffer from mobility problems either due to the onset of old age, an accident, illness or disability. Mobility problems can make live very difficult by those afflicted, restricting quality of life, and limiting their independence. Fortunately, there are numerous ways that a limiting mobility problem can be eased these days, and the primary way for anyone struggling with their mobility is with the assistance of a mobility scooter. 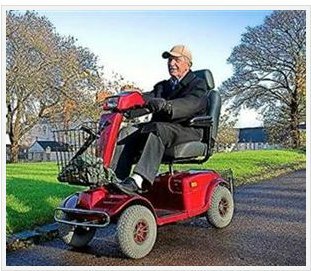 With modern technology, and indeed with the various options available to access mobility scooters and power chairs these days, it is a very realistic solution that dramatically eases mobility issues. The options for acquiring a mobility scooter or power chair mean that there should be an affordable solution for everyone with a mobility problem. Mobility scooters can be purchased outright, either new or used, can be rented or leased, and are even financed through Medicare in some cases. Medicare will pay up to 80 percent of the full cost of a mobility scooter. Mobility scooters are proving to be a safe, efficient and affordable means for people to get around and overcome mobility issues. Many public and private companies offer mobility scooters to assist their customers in places such as malls, airports and other places where people need to move around. There are a number of types and models on the market, including gas-powered and electric, although electric scooters tend to be more popular due to their ease of use and reliability. As there are various models each with a range of functionality, it is highly recommended that you thoroughly investigate the specification of any model you are considering and compare prices. A mobility scooter or power chair can be extremely liberating in providing newfound independence and freedom for those with mobility problems. The only drawback of electric scooters is their battery life, and therefore their range without recharging. This is something you should check when considering an electric scooter. However, it is possible to use an additional power pack to supplement your battery life and range. Also, with more recent advancements in technology and equipment, gel-sealed batteries now offer greater battery power and therefore longer ranges. Mobility scooters can provide many benefits. Whether it is simply to have the freedom to move around the house, or do your own shopping, or to get outdoors with family and grandchildren, a mobility scooter can be the key. With their relative low cost of operation and acquisition these days, low cost maintenance, their reliability, and very quiet operation, it is easy to see why they are becoming so popular in usage today. US Mobility aims to assist by providing a directory of all local stockists and suppliers of mobility equipment. In addition we include information across our web site to help you compare prices and equipment. U.S.A – An insight into disability and a nation’s need for mobility assistance. The American Community Survey (2008) identified that 54 million people have a disability. They represent 19 percent of the civilian non-institutionalized population. This represents a significant percentage of the American population that may require special needs when it comes to mobility and accessibility. This most significantly affects our older generation, as many may find mobility issues stem from old age or illness in later life, and therefore be considered to have a disability at a later point in life. The survey reports that 38 percent of adults 65 and older have disabilities, compared to only 5 percent of 5 to 17 year olds and 10 percent of 18 to 65 year olds. According to the Americans with Disabilities (2005) report 11 million disabled people aged 6 and older require personal assistance with everyday activities. These activities can include such tasks as getting around inside the home, taking a bath or shower, preparing meals and performing light housework. 3.3 million people aged 15 and older need to use a wheelchair for mobility. Another 10 million use a walking aid, such as a cane, crutches or walker. With an increasingly growing older generation, and the escalating issue with obesity in the U.S, the demand for mobility equipment is ever on the increase. In addition to this, the U.S. still continues to have a veteran responsibility for those servicemen injured serving their country. In 2008 the U.S. government paid $36.3 billion in compensation to veterans for service-connected disabilities. The Americans With Disabilities Act 1990 (ADA) marked a new era guaranteeing equal opportunities for all people with disabilities in public buildings, commercial facilities and within state and local government operated services. It is easy to see why a whole industry continues to prosper catering to this growing need for mobility and accessibility equipment. Not only is there an increased demand directly from the population affected by disability and mobility issues, in addition this industry has also benefited from the ADA legislation governing accessibility of so many public and private places. Medicare will provide funding for a variety of mobility aids for those that qualify. Medicare stipulates that for a person to be eligible for any device known as “mobility assistive equipment” (MAE) (this includes a cane, crutches, walkers, manual wheelchair, power wheelchair, scooter), then the item must be needed in the home. For those that do qualify up to 80 percent of the full costs will be covered by Medicare. The Jazzy Jet 3 Ultra Power Chair - The Jet 3 Ultra Power Chair delivers excellent maneuverability, top-performance technology and sleek styling, and best of all at great value. Amigo – Improving Lives Through Mobility - Amigo International, Inc based out of Michigan was created back in 1968 by Al Thieme when he was inspired to design a ‘friendly wheelchair’ to help a member of his family with MS.
BraunAbility - Ralph Braun started out in his global corporation in 1962, when he built a three-wheeled motorized handicap scooter in order to get around. The X-Treme XB-420M Deluxe Electric Mobility Scooter -What an awesome looking scooter is this! Not only does it have the kudos of being aesthetically appealing, it boasts to be the fastest mobility scooter on the market! EV Rider Mobility Products and Services - Mobility scooter company EV Rider started business in 1996 with the design of a battery powered scooter like the original Citybug model. Pride Mobility Products Corp. - Pride Mobility was up until 1986, a family owned and operated business who specialized in power lift chairs. All-terrain and Beach Wheelchairs - They do look a little strange, and there are a number of companies offering different designs, but one thing they do all have in common is the extra large and wide wheels. Renting a mobility scooter in Hawaii - If you are visiting the beautiful islands of Hawaii, either on retirement or vacation, do not let your visit be limited if you have any mobility problems.